In the heart of every Singaporean HBD block is a hawker food centre, a place where the locals convene everyday to eat meals and socialise with neighbours. The food is affordable and tasty, and tourists come for the experience. Everyone goes home full, and everyone is happy. Except for the hawkers. Hawkers have to keep people interested to keep their businesses running. A quintessential ingredient of Singapore’s culinary scene, they impose no dress codes and are focused on one important task: to ensure that the food is delicious. But if you are a hawker stall in a local food centre in Singapore, you are most likely competing with ten other hawker stalls selling the same kind of food that you offer. So in order for you to stand out, you have to literally bring something new to the table. For Chef Chan Hon Meng, his secret to success is being consistent. For the last thirty five years, his humble hawker stall Hong Kong Soya Sauce Chicken Rice and Noodle in Singapore’s Chinatown Complex Food Centre has been serving the same dishes that earned him many loyal customers over the years. He keeps the quality of his food top-notch, and loyal customers would create a bee line outside his store every morning, waiting for him to open for the day. He also keeps his food prices at a minimum to keep his customers happy. After decades of dedicating his life to hawking delicious Chinese food, the world finally recognized him. Chef Chan’s humble hawker stall is the first non-traditional restaurant to be awarded the coveted one Michelin star, securing his business for years to come. And his famous chicken dish? 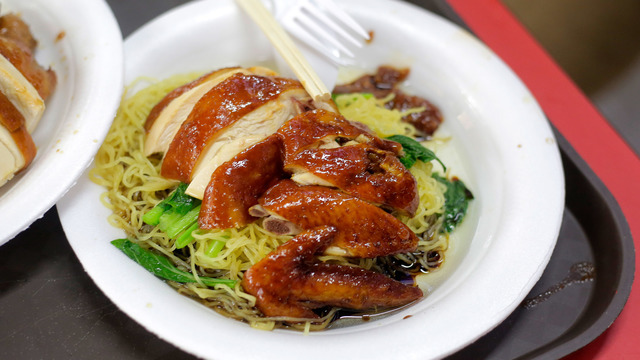 At $2 per order, it is now the cheapest Michelin-starred dish in the world. 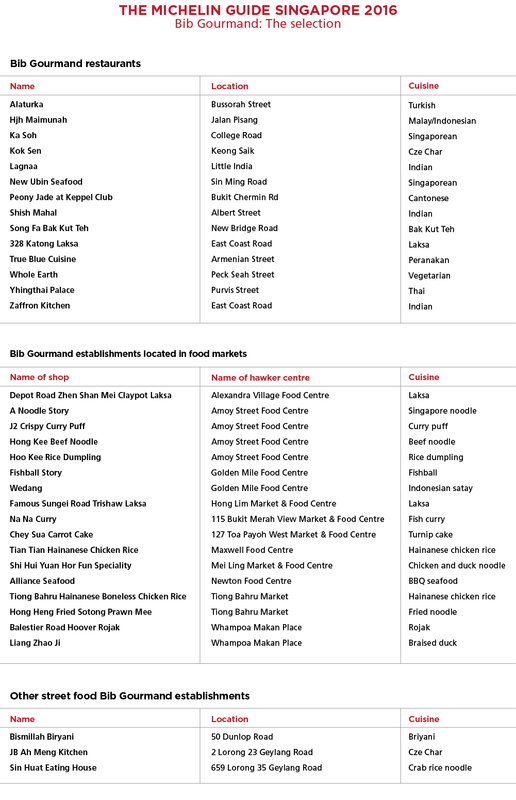 The Michelin Guide released their first Singapore edition this year, containing a special section that names all the local hawker food stalls that one must try in Singapore. Signifying the arrival of hawker food in the international dining scene, Singapore’s very own Michelin Guide is expected to turn the world’s attention to this uniquely Singaporean phenomenon and way of life. Undoubtedly, Chef Chan has his own contributions to the recent attention that Singaporean hawker food has been receiving. His body of work represents the countless hours spent by all the hawkers toiling in front of the stove, his recognition signifies that hawker chefs, even those with no formal culinary training, have now taken the interest of the Michelin Guide. Using only the bare essentials—a deep understanding of food, respect for fresh produce, and the sensibility to handle ingredients—these hawker stalls has fostered a culture of food and sharing that is uniquely Singapore. Unbeknownst to them, Michelin inspectors have long been researching the local food scene in Singapore. They were impressed by the universal appeal of hawker food centres, and they appreciated the importance of having one in every neighbourhood. Singaporeans prefer to dine out instead of cooking their own meals at home, and cooks have responded by consistently offering high-quality, delicious, and affordable meals, creating a satisfying symbiosis between diners and restaurateurs. These are among the many reasons why for the people behind the Michelin guide, Singapore’s hawker food culture warrants to be in the global gastronomic spotlight. This list of “establishments located in food markets” published in the book are the few exceptional hawker stalls given the responsibility to uphold the quality of Singaporean hawkers, and to introduce to the world by way of food travellers the intricacies of hawker dining. 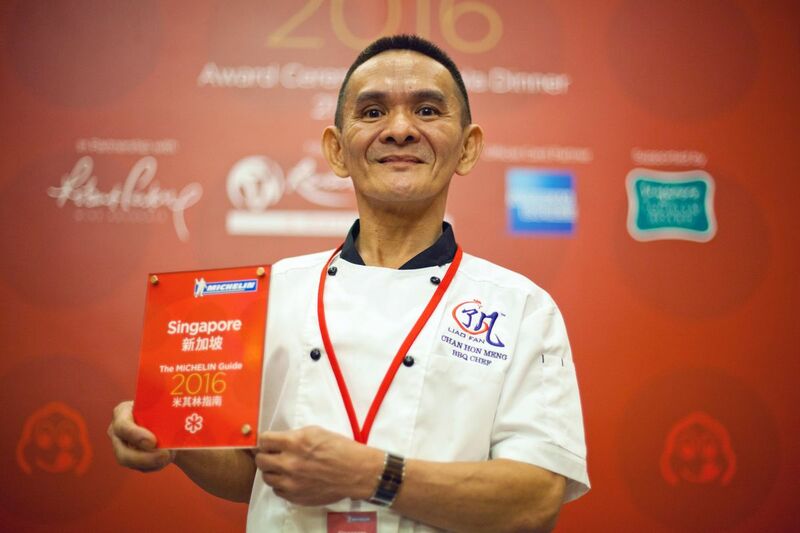 “I really think it’s an honour to represent every hawker in Singapore internationally and bring our cuisine to the world,” Chef Chan remarked upon receiving his recognition. Together with Hill Street Tai Hwa Pork Noodle owned by Tang Chay Seng, these two are inspiring many Singaporean chefs to do better and achieve their own Michelin recognition. The day after he received his Michelin star, Chen Chan immediately went back to work. He won’t stop now, and he can’t. The world already knows about his devotion to consistency, and all eyes are on him. His most important takeaway from the experience? “I hope that every chef will put in their best effort as if a Michelin inspector is tasting your food.” Chef or no chef, let us all make this our personal mantra. Chen Chan’s Michelin star redefines the concept of fine dining. From degustation menus with food artistically plated on immaculate china, to hawker food stalls where food is served on styrofoam bento boxes, the dining scene is evolving. And to appreciate fine dining, we have to go back to basics: we have to be able to appreciate the food for its own merit. No gimmicks, no drama. Just food cooked to delicious perfection, presented in a way only meant to whet one’s appetite. And in this new era of dining, that’s all that matters.